Mutual funds offer investors the benefit of liquidity. Investors buy mutual funds in pursuit of specific investing goals or to help diversify their portfolios. 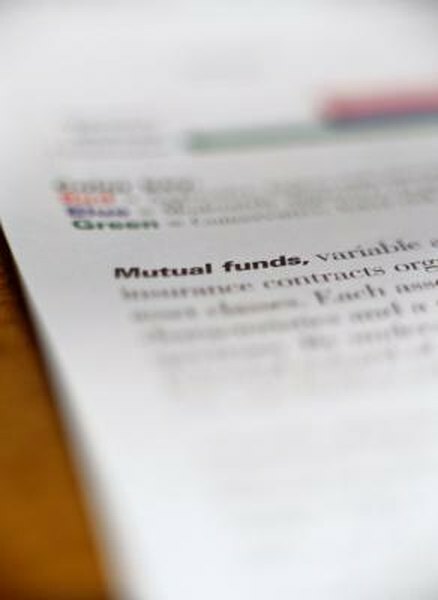 For investors, mutual funds are liquid investments that can be easily and quickly converted back to cash. Because mutual funds manage portfolios that include a variety of investments, including cash, investors use the liquidity ratio of the fund itself to help judge whether the fund will grow. A mutual fund pools investor capital to buy stocks, bonds and other securities. A percentage of ownership in the mutual fund is sold in shares, which are priced by their net asset value. The fund is managed by financial professionals who tailor its portfolio to meet stated goals, which can include targeting specific industries or assuming a specific level of risk. Investors can buy shares of a mutual fund from a brokerage service or save on brokerage fees by buying directly from the financial company that offers the funds. Liquidity in investment is the ability to quickly sell it without affecting the price. Sometimes there are a limited amount of shares available or few buyers for the investment, creating delays for shareholders who want to get the best price from sales of their assets. Without sufficient liquidity, investors' portfolios may not be able to deliver on their market value. Investors value mutual fund shares for their liquidity, according to the Securities and Exchange Commission, as this gives shareholders an easy opportunity to convert shares back to cash in a short amount of time. In addition to the option of selling mutual fund shares through a brokerage, mutual fund shareholders can sell the fund shares back to the company that manages the fund, with payment due in seven days, according to the SEC. The fund portfolio’s cash-to-asset ratio, or "liquidity ratio," expresses how much “cash equivalent” a fund keeps in its portfolio, which can include money market funds, Treasury bills and commercial paper in addition to cash. A mutual fund’s liquidity ratio can help investors judge whether a mutual fund is likely to expand its portfolio. When mutual fund have higher ratios of cash to assets, managers are more likely to make stock purchases, according to the CXO Advisory Group website.